Since I did a post highlighting a few adult books for 2015 yesterday, I decided to add one today for the middle grade. Brown Girl Dreaming reawakened my love for children’s lit. Not picture books or early chapter books but books for the middle grade readers. (Upper elementary readers also included depending on their reading level). As a teacher for 15 years, I spent numerous hours finding suitable books for my students based on tastes, lessons being taught, difficulty, etc. And while I didn’t have much trouble getting my students interested early on, I found that at the middle grades, reading started to peter out. Required reading became a snooze fest and so many other things were going on (hormones, mean girls, team sports, extracurricular) that reading became more of a chore for many students. They weren’t picking up books for enjoyment anymore. Now working in a library, I find similar scenarios. The younger children leave with bags of books and most teens know what they are looking for in the YA section. But often I see children, ages ranging from 10 and up, wandering aimlessly. “What else is there after Harry Potter?”. “Do you have the new Diary of a Wimpy Kid?“. I can feel their pain. Aside from having them re-read the glorious Harry Potter books or just wait for the next series book, what else could/should they be reading? So I made it my goal, my plan, to educate myself with middle grade books again. Even more importantly, more diverse middle grade books that do something other than just entertain. So here we go. I found these on Edelweiss and I am sure there are more to come! Hold Tight, Don’t Let Go by Laura Rose Wagner (Jan 6) This debut might be more suitable for YA audiences with the teenage cousins being 15 years-old, but the story sounds riveting no matter what age. Magdalie and Nadine only have each other after the 2010 earthquake in Haiti and become inseparable in a refuge camp. When Nadine leaves to be with her father in Miami, their relationship is put to the test. Stella by Starlight by Sharon M. Draper (Jan. 6) I LOVED Draper’s book Out of My Mind. She returns with this Historical Fiction novel about a time in history important for younger readers to experience. “When the Ku Klux Klan’s unwelcome reappearance rattles Stella’s segregated southern town, bravery battles prejudice in this Depression-era tour de force”. Red Queen by Victoria Aveyard (Feb. 10) Again, this debut dystopian novel set to be a trilogy (yikes, I know!) might be more suitable for the YA audience. And as much as I can’t get into the series books, I see many middle graders coming in who have read all the popular ones. Over and over again. Hopefully this one will be something new for my “series/fantasy/dystopian/paranormal” readers to sink their teeth into. Moonpenny Island by Tricia Springstubb (Feb. 10) “A warm and deeply affecting story about what it means to see, and why the biggest feat of all may be seeing through someone else’s eyes.” From the blurb it sounds very coming-of-age about friendship, family and finding yourself at that pivotal tween time. Murder is Bad Manners by Robin Stevens (April 21) Daisy and Hazel are modern day Sherlock Holmes and Watson but in middle school. However there is nothing to investigate. Until the body of their science teacher is found and then disappears. This debut mystery series sounds so ridiculously charming! Unusual Chickens for the Exceptional Poultry Farmer by Kelly Jones (May 12) Sophie and her parents move from LA to a farm they inherited and several of the chickens are “exceptional”. This debut is told via letters, quizzes, to-do lists and more. Sounds pretty quirky and fun. 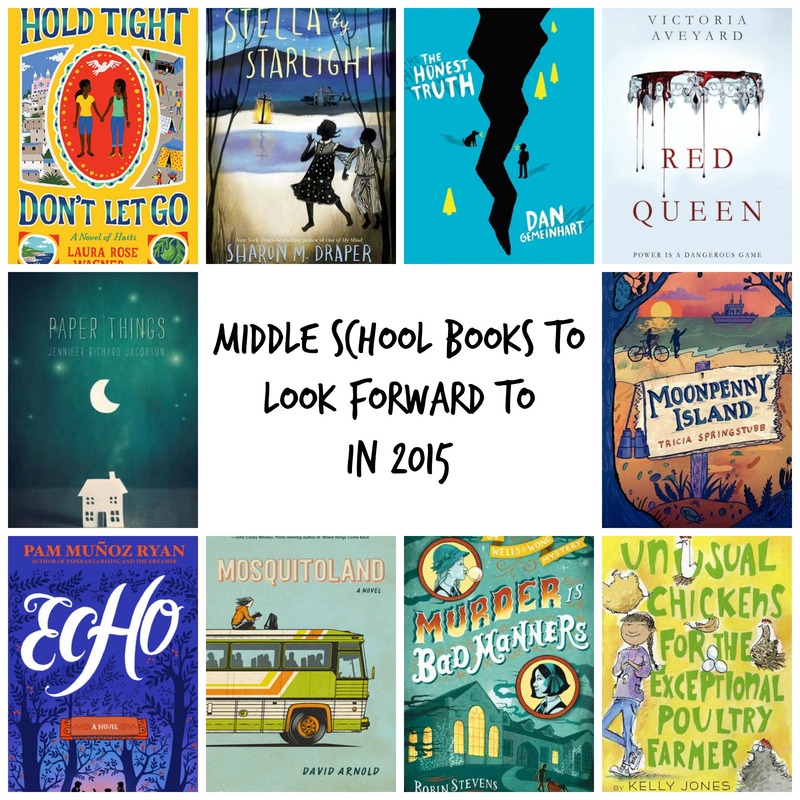 Are there any middle school books on your radar for 2015? Tags: Children's Corner, debut authors for middle grade 2015, middle grade books, new middle grade books for 2015. Bookmark the permalink. Previous post ← Ten Books I’m Looking Forward to in 2015…so far. Wow, these books look amazing and the titles are so cute and clever. I think my kids are still a little too young to read these together, but I may read them myself! Paper Things looks really good, plus I love the cover. 😀 Mosquitoland looks like it could be really good as well. I’m a huge fan of road trip, coming of age type books. Murder is Bad Manners sounds like it will be funny as well as charming. I love middle grade books, thanks for drawing attention to some coming out in 2015!